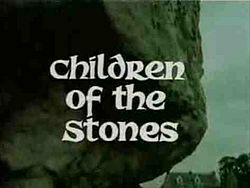 Children of the Stones was produced by Jeremy Burnham and Trevor Ray in 1967 and was broadcasted onto the ITV network in the month of January and February of 1977. Even now, thirty-five years later, it is remembered and cherished by adults who watched the series from behind the sofa when they were kids. Children of the Stones is a television drama created for children, the programme is a one-off serial and the storyline lasted for over seven different episodes, Peter Graham Scott directed and produced Children of the Stones with Patrick Dromgoole as an executive producer. Children of the Stones follows the journey of the astrophysicist Adam Brake and his young son named Matthew, once they arrive in the little village of Milbury that is constructed within the interior of the memorial stone circle, they soon to find out that the village of Milbury is under the grip of weird psychic powers unleashed by the sinister village squire. This cult TV series was filmed at Avebury in Wiltshire during the Summer of 1976, with other scenes filmed at the HTV Studios in Bristol. The music was created by Sidney Sager in collaboration with some of the best known london choral groups known as the Ambrosian Singers. Jeremy had also created a continuation from the story named Return of the Stones.